Every year we welcome the chance to meet promising new business owners who apply for WSWE’s PRISM Scholarship. The winner, chosen from a field of well-qualified applicants, receives a free annual membership to WSWE – a $240 value! – plus a full year of one-on-one mentoring sessions with the members of her choice, based on her unique needs. Congratulations to our new PRISM Scholar for 2018-19! 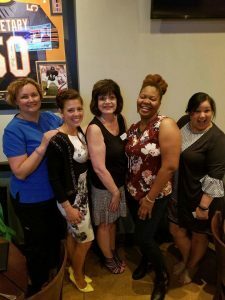 We are proud to introduce Alisha M. Fox of Modern Fox Fertility, second from left, shown here with Charlotte Perry, middle, who brought the program to life, along with former winners Dana Gehlhausen, left, Tanesha Watkins, second from right, and PRISM Scholarship Committee Chair Su Jang. We look forward to offering Alisha our best advice all year long. We accept applications year-round, so feel free to send yours anytime. All applications will be evaluated by the PRISM Scholarship committee. The deadline for 2018-19 applications is Wednesday, May 15, 2019. Candidates chosen for further consideration will be required to attend an informal meeting with PRISM committee members. The new PRISM Scholar will be chosen by the committee and introduced at WSWE’s Annual Meeting & Dinner in June. All applicants will be asked to meet with the WSWE PRISM Scholarship Committee, either at a regular monthly meeting or at a mutually convenient time to be arranged with the committee and the scholarship candidate. PRISM Scholars are expected to attend regular monthly meetings throughout the year (with reasonable allowance made for special circumstances such as illness). Meetings take place on the third Thursday of each month, 8:00-10:00 a.m. Only candidates who can commit to attending most meetings should apply for the scholarship. WSWE will notify the scholarship winner by phone no later than June 1. The winner will be announced at our Annual WSWE Members Dinner and Meeting in June. The new scholar will become a member of WSWE effective July 1st and be introduced at our regular July meeting. PRISM Scholarship requirements and awards are at the sole discretion of the PRISM Scholarship Committee. Requirements may be modified over time to better serve both the scholars and the organization. Questions? Email us at communications@wswe.org. Attend regular monthly meetings throughout the year (with reasonable allowance made for special circumstances such as illness). Meetings take place on the third Thursday of each month, 8:00-10:00 a.m. Participate on WSWE Board as Member-At-Large. Meetings take place on the second Friday of the month, 9:00 – 10:30 a.m.
Act as member of PRISM scholarship committee.